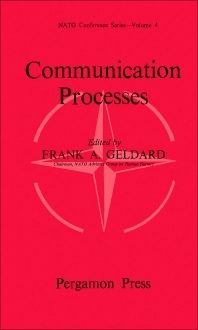 Communication Processes contains the proceedings of a Symposium on Communication Processes held in Washington, D.C. held in 1963 under the auspices of the NATO Science Committee. The symposium provided a forum for discussing communication processes, with participants exploring a wide range of topics organized around data presentation and transmission; language barriers and language training; group communication; and man-computer communication. This volume is comprised of 19 chapters and begins with an overview of research in communication processes, followed by a discussion on the role of science and technology in the Atlantic community. The next chapter is devoted to data presentation, with emphasis on information processing and human factor problems, including the role of redundancy in improving perceptual discrimination. The role of the human operator with respect to the use of speech, the use of keyboards and continuous controls, and the monitoring of some automatic process is then examined. Subsequent chapters deal with the language barrier as an obstacle to communication and how language training can help overcome it; group communication; and man-computer communication. The nature of human-computer interaction and the problems of man-computer communications are examined. This book will be helpful to practitioners and researchers of communication.